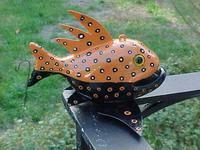 Mark Kirby a Michigan folk artist carves from basswood body and tail and metal fins. 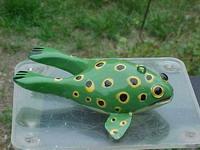 Mark started carving decoys in 2004 and produces only a limited number of one of a kind fish each year. Though a new decoy maker, Mark’s northern pike placed second in the service working class at the 2005 at the Great Lakes Fish Decoy Assn. World Championship held in Monroe, Michigan. Excellent for the collector of modern fish decoys, carvings, and folk art. Mark started carving out of boredom while recovering from back surgery. Since becoming disabled, carving has become a hobby of Mark’s. He has made 45 decoys since he started in 2004. All are original as Mark does not use patterns of any kind, but prefers to hand draw what he is in the mood to carve. He hand carves using basswood primarily, but also use white pine & white cedar. He only hand paints his fish at this time, and use both oil & acrylics. All of Mark’s decoys have carved tails, glass eyes, and metal fins. He signs his fish on their belly with his initials (MK) and year carved. Mark stated that he does not carve anymore but he does sell on eBay under the eBay name of allsortzofstuff.